The others are going to leave this morning for home. We have another night before we have to be home. We say our good byes before we head off to explore Kiandra. 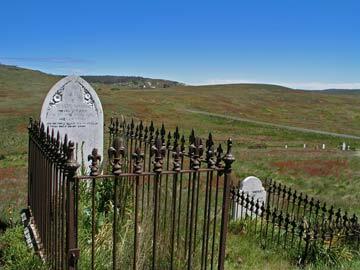 We spend about 90 minutes exploring Kiandra and the cemetery. The old ruins are quite interesting and there are some interpretative signs that explain the history of the area and old buildings. You can still see the indentations in the ground from parthways and buildings. 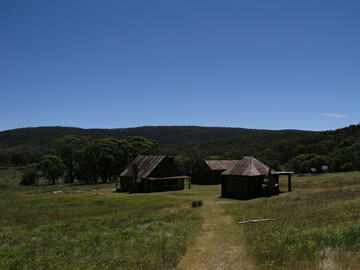 Kiandra was the first place in Australia that skiiing was conducted. There was apparently a small rope tow up the side of the hill. As mentioned in the previous part of this article, in the January 2003 fires I was working here when the fire ripped through from the west. It jumped about 8 kilometres in a few minutes and only a lot of hard work before the fire's arrival (and a lot of great water-bombing from two helicopters) saved the two buildings up the valley (see the panoramic photograph above). 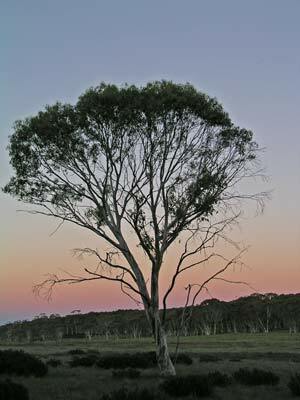 After our time walking around Kiandra, we drive the few hundred metres back towards our campsite and stop beside the small creek at the Cabramurra turn-off (Kings Cross Road). We have morning tea here. When we have finished we head to the nearby Mount Selwyn Ski Fields. 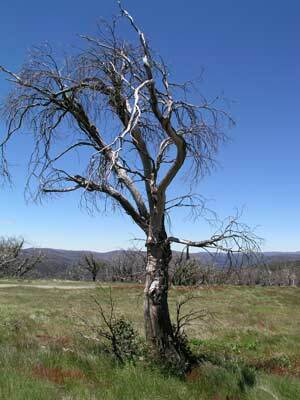 We quickly have a look and then head via the Tumut Ponds Fire Trail to Tumut Ponds. 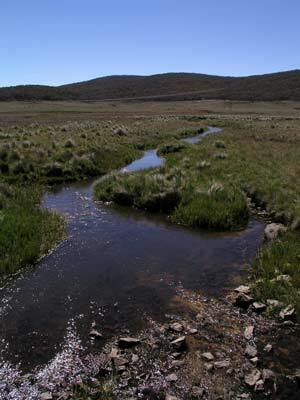 This is another of the dams build for the Snowy Mountains Scheme, although it is one of the smaller ones. The fire trail is a steep and windy dirt track that leads down to the water's edge. There are quite a few fishers camped here, obviously fishing for trout. We backtrack up the track to the Kings Cross Road and then go to Cabramurra. This is a small village established to support the workers when the Snowy Scheme was being built. It now has some nice alpine lodges that provide accommodation for fishers in Summer and skiers in Winter. Very nice. 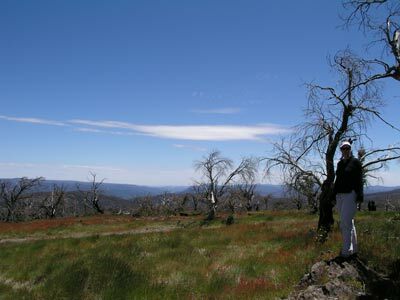 We go to the lookout on top of a hill overlooking town and then have lunch in another very nice picnic area at another lower lookout. After lunch we head north out of town and then take the Link Road. This goes back towards the section of Kings Cross Road that we have come in on. However, before we get to that location, we take the Ravine Road. This leads to an old mining town called Ravine and then we can get back to the Snowy Mountains Highway west of Yarrangobilly Caves. The track is quite steep and rough and we average about 25 kmh. Further along our average speed drops to under 20 kmh. We examine some copper mines before we get to the main section of Ravine. These are located at GPS Reading 35º 47' 31.5"S 148º 24' 08.0"W (note all readings on my 4WD pages are WGS84). The township of Ravine no longer exists. 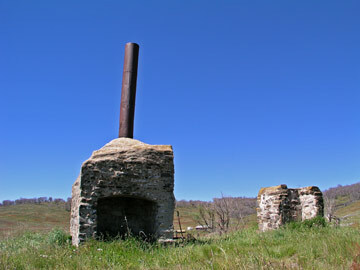 Only the remains of some of the buildings can be seen. Ravine is at GPS Reading 35º 47' 07.0"S 148º 23' 35.0"W. It is only about 20 kilometres in off the Link Road but it takes an hour (including a short stop at the copper mines) to get here. 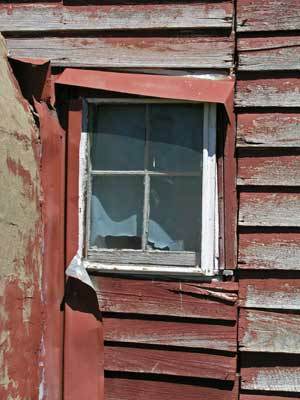 There are the remains of a mud walled house to examine. The track now becomes Lobbs Hole Powerline Road and it starts its climb up out of the valley. About 2.5 kilometres up the track there is a turn-off to the left. This goes down to a campsite at the top of Talbingo Dam. The water level here is relatively high as the dam is a long narrow and deeper dam so water is being pumped to it from the shallower dams like the shallower Tantangara to minimise evaporation. There are some fishers here with their camp and boats. We continue up the track. It is also steep and our average speed of almost 30 kmh soon drops to under 20 kmh. Further up the track flattens out a little and we go a bit faster. After 15.7 kilometres we come to an intersection with the Blue Creek Fire Trail. 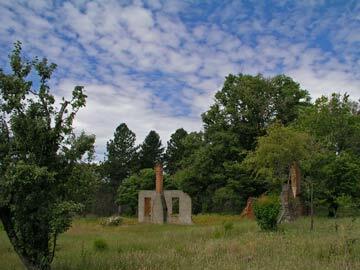 We turn right and 1.4 kilometres down the track we come to the old ruins of the Jounama Homestead. 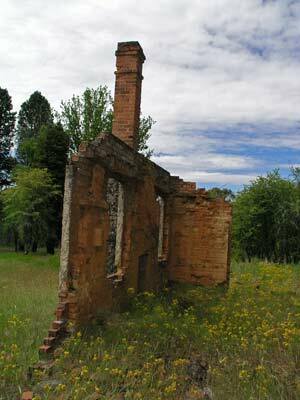 This must have been a quite elegant homestead in its prime. 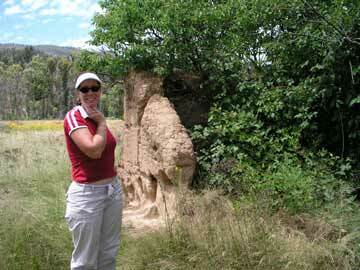 We spend a short time exploring before heading back along the track to the intersection. It is just under 5 kilometres to the highway and we then head east. We decide to drop into Yarrangobilly Caves as we will not have time tomorrow to visit before we head home. The good dirt road in is windy but suitable for two wheel drive vehicles. As it is late in the afternoon, we cannot spend much time here and all the caves have already closed. I have been here during the 2003 bushfires when I spent a few days as part of the team protecting the buildings from the approaching fire and then after it passed making sure that it was well and truly out. There is a thermal pool here but after having heard a lot about it during my work, I was disappointed when I actually tried it out that it is really only as warm as a normal heated swimming pool. I had thought that the temperature would be like ones I have been to in New Zealand. We arrive back at the campsite a little after 5 pm and break open a couple of beers before cooking dinner. After dinner the sunset starts to look like it will be spectacular so we walk along the fire trail back towards the highway where it is a bit more open. I think that some of the trees here will look great when the sun gets lower. We take a few photos and get some really good shots. Tonight we are alone here and it is a very relaxing evening as we watch the stars and count at least 35 satellites pass overhead. We pack up the camp and head out to the highway. We go a little north to the Long Plains Road and travel over the same section we did two days ago. However, we keep going past Port Phillip Road and a bit further up we cross the Murrumbidgee River. This is almost the start of this great river. Here it is the size of a creek that you can easily jump over. Crystal clear water burbling across the valley. Our next stop is Cooinbil Hut. A very nice spot but more horse owners and horses. 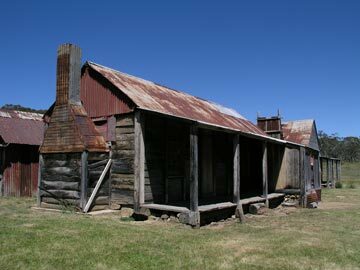 From here we head to Coolamine Homestead. To access this you travel down the Blue Waterhole Trail. This is really the same road (Pocket Saddle Road) that we were on two days ago when we travelled from Currango Homestead to Tantangara Dam wall. However, it is closed just north of the homestead and is closed at the Blue Waterhole. There is a camping area here called Cooleman Mountain. It is quite nice. 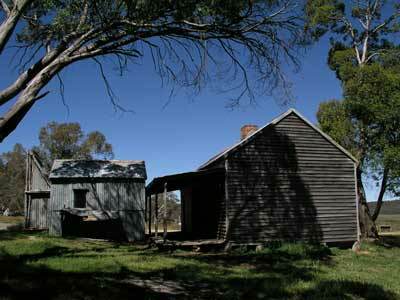 The Coolamine Homestead is an amazing complex of buildings. 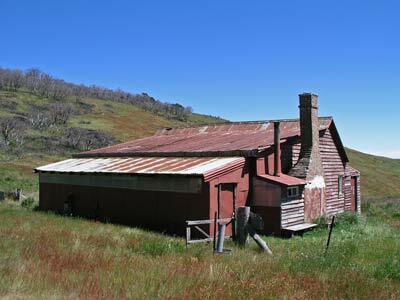 These have been restored over the years and now provide an amazing reminder of how the people lived in the high country 100 years ago. 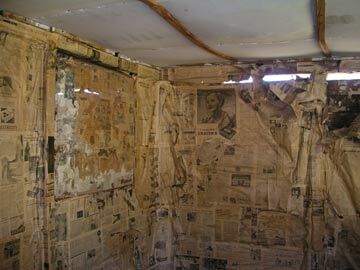 Inside the main home, the walls are lined with old newspapers. They cover many years, with lots from the 1930s (look for reports of Don Bradman's batting). Take a torch so you can read the papers and look at the advertisements. At the Blue Waterhole there is very little water due to the drought. 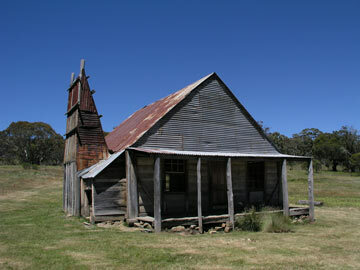 This also has a camping area which would be a good place to stay. All the books and maps we have are not clear on what roads are still open once you get towards the boundary of the national park. It appears that Long Plains Road is closed where it exits the park so we take Broken Cart Road. This then meets up with Boundary Road. You cannot go left as this road is blocked and we are not sure about the right one (as it turns out, you can turn right and follow Boundary Road as we later encounter it). We go straight ahead. This has the worst tracks that we see on this trip and some parts are very slow. We come across a ute that is struck but after about 10 minutes he frees himself and gets going again. 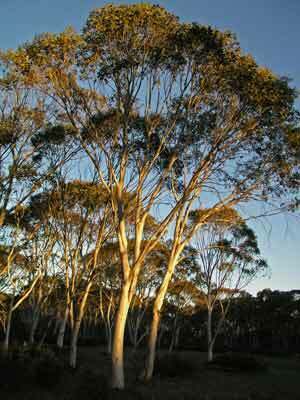 There is a camping area right on the edge of the park called Dubbo Flats. This is not really all that nice and consists as far as I can see of a flat green paddock that is criss-crossed by the tracks of vehicles trying to cross when it has been muddy. Forget this one. This leaves the park and we are now in state forest. The road is poor at first but then improves. We head to Cotter Dam and through Canberra and head back up the Hume Highway to Sydney. Well, this was not the holiday that we had planned, but it taught us a number of things. The most important was that Kelly and I could get along when stuck together in a shithole of a place with virtually nothing to do. It was around this time that I decided that I wanted to spend the rest of my life with her! Of course, you could do most of the trip that we ended up doing but in far few days. 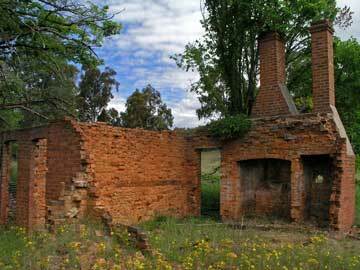 You could spend four nights in the area we ended up in and do a bit more exploring around Adaminaby and between Tumut and Kiandra on the way in. I would also avoid if possible the Christmas School Holidays as all the best camping sites are totally overrun with horse owners and their horses. Even if you can get a spot, the smell would be enough to put most off. 178.9 litres at an average of 14.6 litres per 100 kilometres. A bit higher than normal due to a lot of fast freeway cruising and some slow stuff.